CAPTION: Posing with E. Lynn Harris and my mother, Patricia Stephens Due, at Books & Books in Miami. OK…send prayers up. I'm off to my meeting with one of Hollywood's most powerful ladies. Got the suit on and the new scent I purchased yesterday and I'm ready for my close up. When I think of E. Lynn Harris, who died on July 23, this is the moment I remember: I’m walking in a sea of humanity in Manhattan, hitting a crosswalk as two waves prepare to meet from opposite sides. There, dead-center in my path in a bright crimson jacket, walks E. Lynn Harris—with a grin for miles. That is my mind’s snapshot of Everett Lynn Harris, New York Times bestselling author, trailblazer and stellar friend. The prince of the city, afloat on effervescence, a warm face in a sea of strangers. E. Lynn, how do I count the ways? You gave us all so much. Did you live your life to the marrow because you knew you would only be visiting with us for so short a time? Friday, Sept. 25, is E. Lynn Harris day, and many of us whose lives were touched by E. Lynn Harris’s work and spirit want to help him fulfill one of his last unrealized dreams: E. Lynn wanted to be #1 on the New York Times bestseller list. He had ten New York Times bestsellers—remarkable for a black male writer—but he never hit #1. With his posthumous novel MAMA DEAREST, we hope to help make that happen. I will join writers nationwide to participate in E. Lynn Harris Day Friday. I will appear at 7 p.m. Friday, Sept. 25, at ESO WON BOOKS, 4311 Degnan Boulevard in Los Angeles. (For more information, call 323-490-1048). A complete list of E. Lynn Harris Day events can be found at www.elynnharris.com/tour.htm. Nationwide this week, authors like Eric Jerome Dickey, Victoria Christopher Murray, Tina McElory Ansa, RM Johnson and others have been appearing in Atlanta, New York, Philadelphia, Washington, D.C., New Orleans, Dallas, San Francisco, and other cities. In both fiction and in life, E. Lynn Harris was a giant. In the world of African-American fiction in particular—those tightly-knit networks of book clubs, readers and writers—a mighty tree has fallen, shaking our forest floor. E. Lynn tried to clear the path for the rest of us. Read the remembrances on the news and the internet, and person after person cities E. Lynn Harris’s generosity, whether or not they knew him personally. He offered grace to everyone in his presence. He embraced the spirit of entrepreneurship while enchanting readers with his novels again and again. But it wasn’t just his novels readers fell in love with: Reader after reader remarks that they feel like they knew him, that he was a member of their family. To me, what is most remarkable about his ascent is the unlikely way in which it came about. The black community is not unique in its history of homophobia, but homosexuality was far from a comfortable topic in black America when E. Lynn began publishing. Then E. Lynn Harris introduced a sexually conflicted character named Raymond in his novel Invisible Life. He hauled self-published novels in the back seat of his trunk because he had a story to tell. He wrote from his heart, and his heart was so big that legions followed him. E. Lynn Harris’s fiction told gay readers that they were not voiceless, nor were they alone. For straight readers, he opened the closet door and shined in a light. Gay or straight, readers loved him. He made his characters feel real, which our readers demand, and the author’s sweetness and love always shone through. The proof is in the pictures: Reader after reader, me included, displayed photos of themselves posing with E. Lynn at a book signing. In city after city and town after town, E. Lynn Harris made his readers’ day. In his photos, his smile never faltered. No one ever forgot an E. Lynn Harris book-signing. He was a showman whose main act was being himself, a gentleman author in the truest sense. He wanted the last person in line to feel as cherished as the first person in line—and his lines were hundreds of readers long. When I first started publishing, I was lucky enough to be seated next to E. Lynn Harris at a Black Expo at a convention center, where his line snaked as far as I could see. I was still shocked to be published in those days, and only a handful of readers knew who I was. While E. Lynn Harris signed autograph after autograph, I watched the master at work. Each time he did, three or four people bought a copy of my book. And so the day went on. In the years to come, he became my most consistent mentor. He had advice at every stage on the business end of publishing. Even if he was on book tour, it seemed that any email sent to E. Lynn was usually answered within the hour—if not immediately. (And this was in the days before Blackberries.) He once told me that he answered 200 reader emails a day! My mother, Patricia Stephens Due, was my manager in the early part of my career, so she and E. Lynn ran into each other often on the book circuit. Once, she gave Lynn a mantel clock and pen holder styled with books—and when he later gave us a tour of his Chicago apartment, the clock was prominently displayed at the top of his desk. When we told him that we wanted to write a book about the civil rights movement, he got excited and encouraged us with instrumental advice. 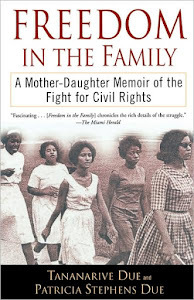 That book later became Freedom in the Family: A Mother-Daughter Memoir of the Fight for Civil Rights, which I co-authored with my mother. E. Lynn told me he wanted me to make an appearance in Arkansas—and announced that he was going to fly me in and put me up in a hotel out of his pocket. “More people need to know you,” he said. I wasn’t the only one, by far. In recent years, I had not seen E. Lynn Harris often—which was why it was so thrilling when we were both nominated for NAACP Image Awards this year, and I was able to give him a long-overdue hug at a party at CAA in February. He emailed me after he heard that we’d won: Congrats to you guys. I had a feeling you would win. You're a fabulous writer and your time on the list is coming. Thanks for looking after B. He texted me and the excited me was busting out of my phone. We sent each other comments back and forth each other’s Facebook pages from time to time, but that email after the Image Awards is my last real correspondence with him. Gracious, vintage E. Lynn Harris. I was first introduced to E. Lynn Harris through Blanche Richardson, the longtime owner of Marcus Books in Oakland—the oldest black bookstore in the nation. At my first book signing in Oakland, she laid a stack of my first novel on a table with Post-Its listing several names: Terry McMillan. Octavia E. Butler. Tina McElroy Ansa. Bebe Moore Campbell. Walter Mosley. E. Lynn Harris. I was blown away, so nervous that my hand practically shook as I signed the books. Blanche wanted to make sure I as properly introduced to the titans in black fiction. I don’t know how my career would have caught any wind without independent black booksellers like Blanche, and our black bookstores are dying. The loss is incalculable. Now, in the midst of ongoing hardship, has come a terrible blow. An unimaginable blow. I heard about E. Lynn Harris’s death on Facebook, that chaotic village square that is rife with town criers when there is news to share. R.I.P. E. Lynn Harris, read several status updates from my friends, reminiscent of the R.I.P. Michael the weeks before. This had to be an internet hoax! I steadfastly refused to believe it could be true. In my mind, I had just talked to E. Lynn Harris the day before, because he had posted a giddy update from Los Angeles during a book tour stop. On Thursday, I fired back a cyber pat on the back—Let’s all storm Hollywood together!! !—as did at least 70 of his other Facebook friends. A writer’s Facebook friends are a fascinating blend of complete strangers who read your books, current real-world friends, family, and people you haven’t seen since elementary school. They’re a supportive bunch. E. Lynn went into his meetings with the Facebook winds at his back. As far as we were concerned, we had just talked to him and he was doing great. I like to think that E. Lynn died happy. By accounts I’ve heard, he had a great day of Hollywood meetings—which is, in itself, a kind of Hollywood ending. Hollywood is the writer’s last mountain, and E. Lynn might have felt that much closer to his dream of bringing his work to movie audiences. I remember him telling me how devastated he was when Aaliyah died in her 2001 plane crash, when he was left with the same sense of disbelief: But I was just talking to her! E. Lynn, we were just talking to you. The passage of days doesn’t make it any easier to believe that you are gone. Wow, Tananarive. Wonderful tribute. :-D You know, I've had friends and relatives who have read his work, but I never have. I think I'll pick something up. I always thought to myself, "Boy E. Lynn is creating a new category. Wonderful...wonderful." It was certainly interesting for me to read that post. Thanx for it. I like such topics and anything connected to them. I would like to read a bit more on that blog soon. I just HOPE that someone would honor me in the same way that you honor Harris and other fallen comrades. The way that you do so is a story within itself. TLegacy!